Do the mutual fund recommendations made in one of the most expensive investment books of all time hold up? Does the mutual fund advice in one of the most expensive investment books hold up to the test of time? As of me writing this introduction paragraph I have no idea what the answer is to this question. Seth Klarman, author of a well received currently out of print investment book that sells on Amazon for nearly $2,000 (see http://amzn.com/0887305105), lays out some investment advice to those of us who don't invest full time, in the last chapter. He recommends either going with a value focused mutual fund, or finding a talented and dedicated investment advisor who is on board with value investment fundamentals. For those of us with less than maybe $100-250K in assets to hand over to an advisor, it will be difficult to find someone who can give the kind of dedication that Klarman recommends looking for in an advisor, leaving a mutual fund as the only viable recommendation. Interestingly Klarman lays out a few specific recommendations for value focused mutual funds that were available at the time in 1990. Since 1990 we have gone through just about every market condition, including one of the most major crashes in the history of the stock market, along with a few super impressive bubbles such as the dot com boom of the 2000's. Of any segment in time to really test how an investment philosophy pans out relative to something else, between 1990 and today seems like just about the best test scenario you could hope for. So the next question is what do we test Klarman's recommended mutual funds against? Well Klarman really pans the idea of index funds. In fact he incorrectly (as of today) predicted that index funds would go the way of the dinosaurs. However when you consider the growing popularity of index ETF's, along with Vanguard, one of the largest mutual fund companies in existence making its bread and butter predominately on cheaply managed index funds, this can't seem farther from the truth. Perhaps this prediction will pan out in the future, but it is not looking so good as of now. Taking this into consideration, and his mention of the S&P 500 as an example of an index that people like to invest in, lets compare Vanguard's S&P 500 mutual fund returns to Klarman's recommended value funds over the longest time-frame possible. So Klarman recommends two families of mutual funds, and recommends against class A shares with their front-loaded fees. The first is Franklin Templeton's Mutual Series Funds of which the following were available near the beginning of 1990 (FCMRX, TEMEX, TEMQX, TEMTX), and the Sequoia Fund (SEQUX). The vanguard fund I am comparing is the S&P 500 investor index fund (VFINX). There is currently a cheaper "Admiral" version of the Vanguard index fund, but that only became available in 2000 as far as I can tell. The chart I put together on Morningstar's web site comparing these funds should be available at this link. I compared two scenarios, the first would be if Klarman were to recommend that a friend invest in these funds in 1990 while he was writing this book and examining these funds. I chose 2/28/1990 because that was the earliest I could get the slider in that year. The other scenario is that in early 1992, you just read this book when it was hot off of the presses, and invested in these fund recommendations. Klarman's value mutual fund recommendation outcomes had you invested in 1990 around when he was likely writing his book. Klarman's value mutual fund recommendation outcomes had you invested in 1992 just after reading his book when it was hot off of the presses. Whether you invested in 1992 just after reading this book when it was hot off of the press, or in 1990 when Klarman was likely considering available mutual fund options for this chapter, it really doesn't appear upon quick visual inspection that his recommendations did phenomenally better than what he strongly advised against: a mutual fund based on the S&P 500 index. They do appear to generally beat the index fund though, with a single exception, the Franklin Mutual Recovery C fund which performed a little worse. Most of these value funds do appear to exhibit the telltale signs of being a value fund. For example notice the peak around 1999 that corresponds to the dot com boom and bust. These funds tended to be flatter around that peak, which Klarman said typically happens with value funds when the market gets really hot. One of Seth's other assertions about value fund performance is that when the market as a whole drops, value funds if they indeed are investing in value stocks, have a greater margin of safety so they will tend to drop in value less. When we focus in on 2007-2008 between the peak and trough of the market, we would predict that these value funds would have lost less value than the naively chosen S&P 500 index. This is the case with some funds, but not others. Mutual Beacon, Mutual Shares, and Mutual Recovery perform worse than the S&P in this window, while the other 2 Sequoia, and Mutual Quest outperform the index. 2007 peak to end of 2008 market low point. Another assertion is that given the value opportunities that one would get from a severe market crash like the one that happened in 2007-2008, there would be really nice value buys available to these savvy investors. However even in this fairly optimistic window, only Sequoia outperformed the S&P 500 index. Indeed it seems like the only thing that really helped these value funds in the long term generally outperform the S&P 500 index was the dot com bust of 2000 through 2002. Indeed in this window, each of these funds gained the upper hand on the index. It really is not clear to me that these professionally managed mutual funds handily outperform a cheap index fund of stocks over the long term. While Seth Klarman's arguments in favor of value investing make a ton of sense to me, and people like Seth Klarman in the hedge fund world have apparently done very well over long periods of time, these value focused mutual funds recommended at the time by him did not clearly withstand the test of time. For example if you and 4 of your friends had read his book in 1992, and each of you invested in a different one of the 5 value mutual funds recommended by Klarman at the time, one of you would be fairly upset that you had not chosen to simply invest in a cheap index fund! That one person would have 27% less money than had they invested in the index. Also one of you would be pretty indifferent because you would only have a fraction of a percent more than had you invested in the index fund. On the other hand the other three of you would be better off by between 27% and 62%. Two of your group of five friends would be at a wash (or worse) while three of you would be quite happy with Klarman's advice, 22 years later. This reminds me of a book I read a while ago that he scoffed at in his writing, a random walk down wall street. Although there is probably some non-randomness in skilled value investor's abilities to chose good investments, when you factor in the higher investment fees to pay those professionals to do their job, along with random bad luck, there does not appear to be a free lunch here! Now that I have the critical aspect of my group's Android app up and running, I wanted to say a little about how cool it could be. 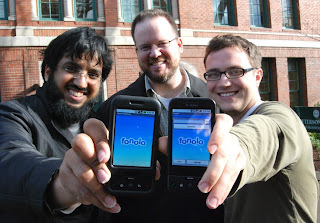 It is an application that integrates with an external service called fonolo, and will provide a clean Android specific user interface for working with fonolo. What fonolo does is really cool. They eliminate the need to navigate those annoying phone menus when you call a typical large corporation. Instead they maintain a text representation of the options, and you can quickly skim through to select the exact location you want to get to. When you submit the request to fonolo they place the call on their end, automatically navigate the phone menus, and then call your phone with the company and department you want on the other end. The android app makes it even cooler because rather than having to navigate to the website and log into that, you can do it directly from the application in your Android based phone! One big thing I am learning from this project is how cool of an operating system Android is. It is incredibly easy to write programs for the system, and you can write code on any operating system that supports Java(unlike the iPhone which requires OSX and XCode as far as I know). Additionally to deploy your application on the Android marketplace, you only have to pay a one time fee of $25 as a developer. For the same privalege you have to pay $99 for the iPhone marketplace. Once more Android based handsets come out I am sure Android will be very competitive in the internet phone marketplace. I just finished a very stressful term that involved applying to grad school, and three tough computer science classes. Now that it is over, I am already getting ready for next term and a whole new set of challenges. This coming term I will be writing up and presenting my undergraduate thesis based on work that I have done on and off since September 2007 under Joe Thornton and Bryan Kolaczkowski. Additionally I will be working on Software Methodology, a demanding Computer Science course that centers around a group programming project. I already have some ideas of what I would like to work on for that course. I am getting interested in Android, Google's new open source mobile phone OS. Developing apps for it seems pretty straight forward. Also once the apps are done, marketing them is as easy as uploading them to the Android marketplace. Although Android doesn't currently reach as broad an audience as the iPhone, I believe that it will eventually overtake the iPhone in the global marketplace. Additionally while the iPhone requires programming in objective C, which I have no experience with, Android is built on Java which I am fairly comfortable with. All in all Android seems a much better investment of my time and energy. Hope everyone is having a happy holiday season. In preparation for the biology GRE subject test I need to re-learn (or learn) general biology. My upper division work has been focused on evolution and computational techniques, so I am very rusty on most other biological topics. Today I went over organelle structure and function in eukaryotes (organisms that have membrane enclosed structures within their cells such as animals, plants, protists, and fungi). As well as containing the chromosomes, the nucleus contains the nucleolus which is the production site for ribosomal subunits. These subunits are then shipped out of the nucleolus, then the nucleus and into the cytoplasm. The ribosomal subunits are destined to either float freely in the cytoplasm where they eventually link up over messenger RNA (mRNA) to make proteins destined for the cytoplasm, or they attach to the walls of the endoplasmic reticulum (ER) where they produce proteins that are destined for a membrane or export out of the cell. It is also interesting to note that the mitochondria and chloroplast produce their own set of robosomes that more closely resembles procharyotic(bacteria, archea, etc) ribosomes. The destination of proteins is determined by their amino acid sequence, structure, and sometimes post-translational modifications. Proteins that are to be secreted out of the cell have a hydrophobic signal sequence called the signal peptide. Lysosomes are interesting. They have enzymes inside of them which digest proteins, carbohydrates and nucleic acids. These enzymes function well in an acidic environment where the pH is about 5 (a cell's pH is closer to 7 meaning it is neutral). This fact keeps the overall cell safe because the enzymes aren't able to digest the cell in its higher pH environment. However inside the lysosome, the pH is kept at 5 so that the enzymes are able to do their work. That is a very interesting adaptation. Peroxisomes are similar and break down fats and harmful chemicals like alcohal. These organelles do so through the production and degredation of peroxide, which if allowed to come in contact with DNA would be very dangerous. Thus the reactions are kept within the peroxisome. The mitochondria and chloroplast are cool. They have their own DNA, and produce many of their own proteins. They are basically like a small unicellular organism that lives within the cell and produces the energy needed for the cellular function. Biologists theorize that these organelles were once seperate organisms that entered into a symbiotic relationship where they exchanged energy production for protection and a stable environment.